Almost three years ago I started taking comedy writing classes--the same time I started working for City Food Tours, and then preparing to be a tour guide myself! Since then I've been struggling to find a way to combine my two passions--food and comedy. Then a few months ago I realized that a lot of the chefs I know are rather funny and a lot of the funny people I know are really into food and thus the idea was created! Make the food people be funny and the funny people make food! 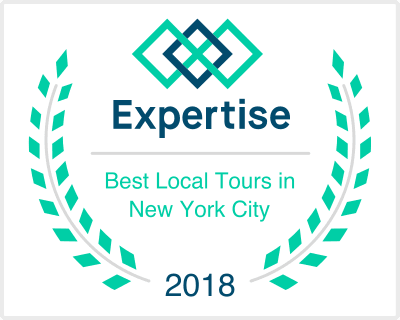 :) So, I found the perfect venue on the Upper West Side, which happens to be managed by my sister, and spoke with the owner and started booking the talent. Well--now I have a show to put on! Of course, it's rather appropriate that the first show of the New Year features two food pros who are known for a healthier relationship with the edibles. Christy Harrison is a Registered Dietitian Nutritionist with her own podcast about the psychology of food, which I'll touch on more tomorrow, and she'll be battling with her improv chops against Nicholas Feitel, who'll be recognized by Bethenny Frankel fans as her former chunky food blogger who lost over 60 pounds with a little help from his friends! Our funny ladies, however, are more known for their comedy stylings on the prestige Upright Citizens Brigade stages. But the daring broads will be taking on a mystery box cooking challenge with 5 junk food ingredients that I'm already nervous about tasting! Johnna Scrabis, who's a very funny improviser on the UCB Harold team, Side-Piece, has not even bothered to tell me how much (or how little?) skill she has in the kitchen. And her counterpart, Sarah Wharton, who was on the 1st all-female house improv team at UCB, Detroit, promises she's an "avid home cook", but if she lives alone, that's not saying much. All of this is going down on Mondays at 9pm, starting on January 5th at the legendary West End Lounge. Located on the Upper West Side, we're sandwiched between one hell of a line up for anyone into the arts, and of course, F&B! Before The Food Funny, you can check out Bound for Broadway, where you'll catch tomorrow's big superstars. Then, after the show, you can get drunk at the hand of my sister who's on bar starting at 10pm. And if you're in the service industry yourself, you can stick around for Service Industry Night, which gets you 50% off drinks after midnight! Which is when Midnight Movie Massacre begins as well!